Earlier this month, July 2015, I came across a neat shoebox Shocker on ebay. 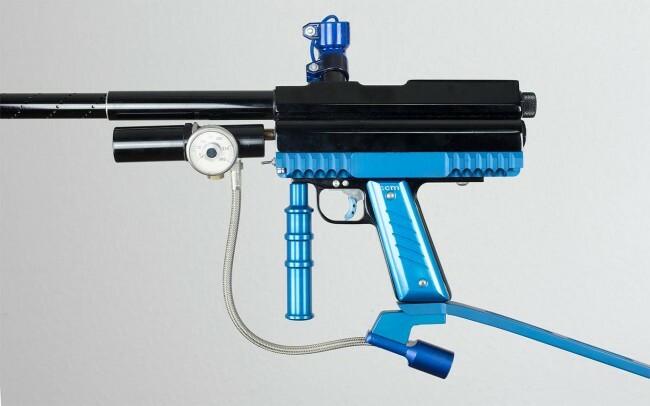 I occasionally browse shoebox Shockers on ebay, looking for early Pneuventures guns, such as the Cyber 9K. There are usually a pretty large variety of later splash patterned Smart Parts guns listed, but I’d never end up pulling the trigger on any purchases. 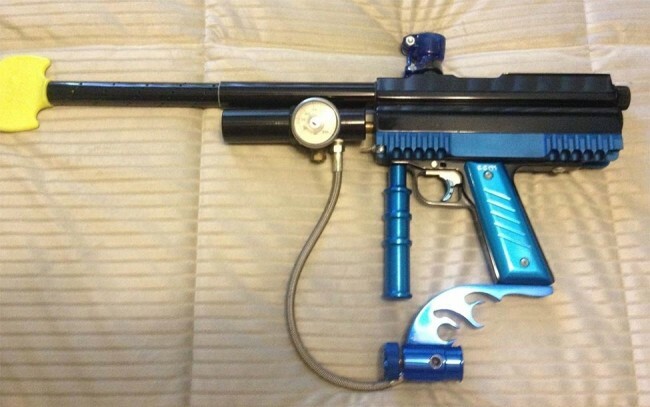 A CCM Shocker listed on ebay? Photo courtesy Anthony Granata. Anthony Granata’s custom Shocker that was modified by Granata’s childhood friend, Garett Maxwell, of CCM. Although the name wasn’t specifically mentioned, it was obvious that the work on this shoebox Shocker was done by Garett Maxwell, who played for the CCM Factory Team, the All Americans (or Philly Americans?) and Dynasty. After speaking with the Granata, the seller, I learned that both he and Maxwell also played together on the 5 man team, Blind Fury, based out of Northern California Adventure Games in Anderson, California. Anthony Granata’s Blind Fury Jersey. 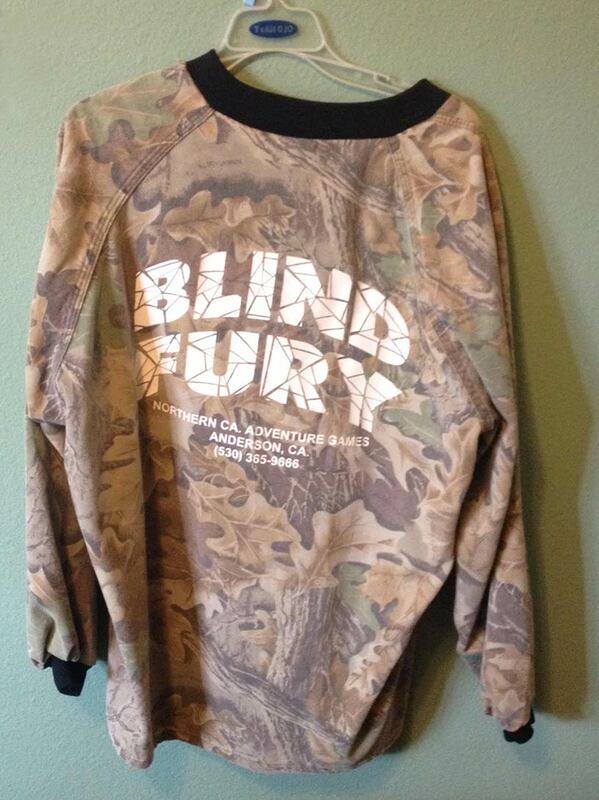 Blind Fury was a 5 man team based out of Northern CA Adventure Games in Anderson, California. Looking at Anthony’s location I saw he was in Northridge, about 25 miles North West of Los Angeles. So I asked Anthony if he would be willing to meet up and record a video if I won his auction. 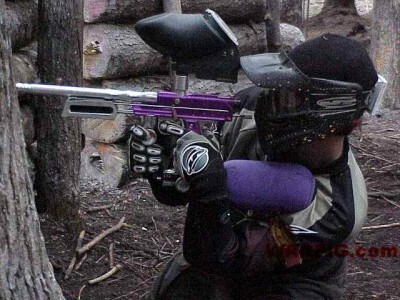 About a week later we met up and Anthony explained his paintball history, playing in Northern California. Anthony Granata’s shoebox Shocker, modified by his longtime friend, Garett Maxwell. Granata met Maxwell in about 5th grade, in the early 90s, when they became neighbors in Cottonwood, California, which is near Redding. 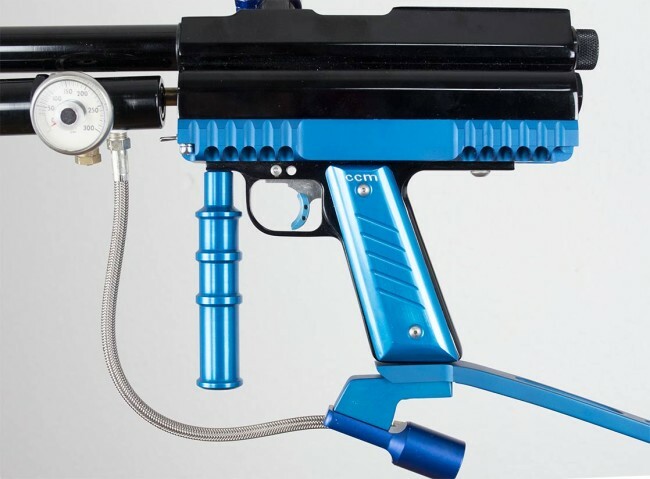 They started off with pump pistols and later moving to Tippmanns and then Autocockers. 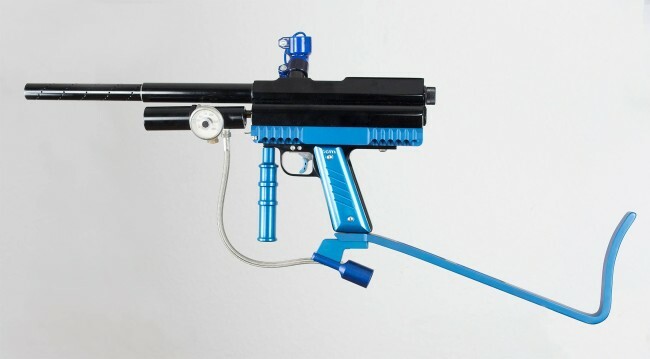 Left side view of the body and blue highlighted accessories on Granata’s Shocker. In the video, Anthony goes on to tell a bunch of neat stories about his friendship with Garett Maxwell and early projects that that were completed out of the machine shop in Maxwell’s grandfather’s garage, located in Redding. 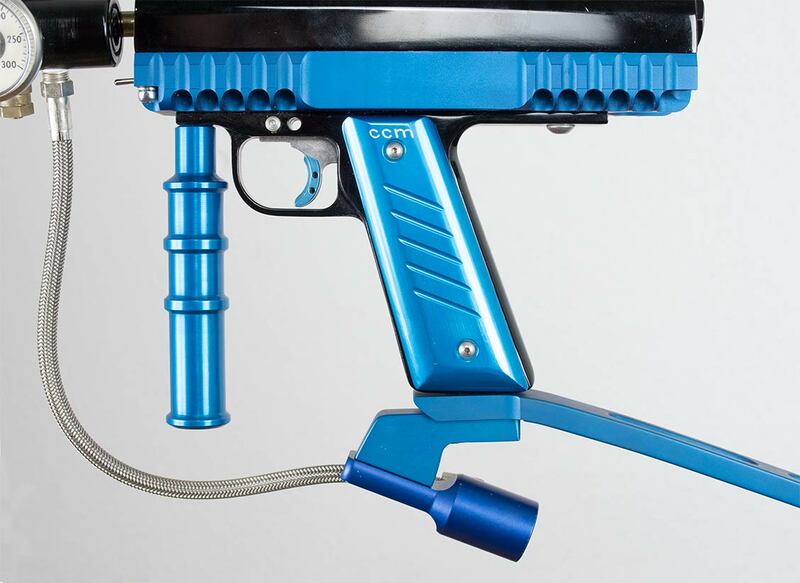 Right side view with highlighted CCM grips on the CCM Shoebox Shocker. This 4×4 likely dates to 1999-2001. One project Anthony describes was the conversion of his Autococker to a Sniper. Granata remembers how they decided to compete in a pump tournament with their five man team, Blind Fury, and but he didn’t own a pump. They went to Maxwell’s grandfather’s shop and Garett made Anthony a pump kit out of wood and misc pieces. Close up of the CCM grips, Maxwell’s rail foregrip and stock on the Shocker. It’s hard to say exactly what piece Maxwell fabricated but according to Anthony he made the body and possibly the receiver as well. This could have been the start of the G-Max 86 frame? But that would have likely been too early. 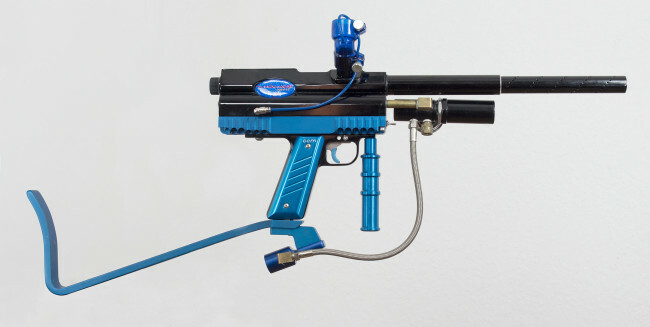 Left side view of the Shocker’s L stock. Possibly made by Maxwell? Anthony mentions that Garett made the L stock on this Shocker. The recessed area for the drop is similar to a stock on an Automag I own, so if the stock was made by Maxwell it would shed some light on that Automag’s origin. 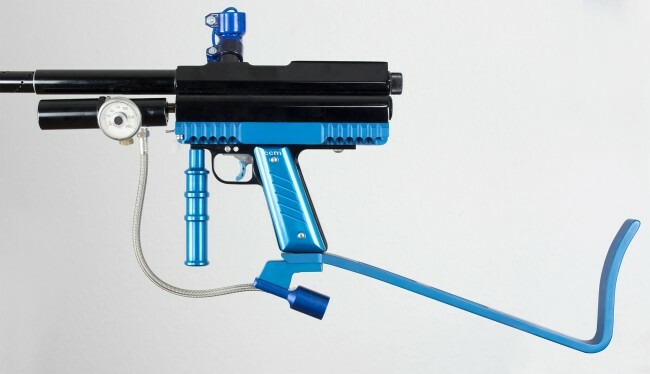 I think the Shocker’s stock was likely made by someone else and might of just had additional cuts by Maxwell prior to anodizing? But I can’t confirm either way so hopefully a reader remembers some details on these stocks (or this mag)? Classic Automag with similar stock. ASA is recessed into the drop combo. Origin of custom work unknown? 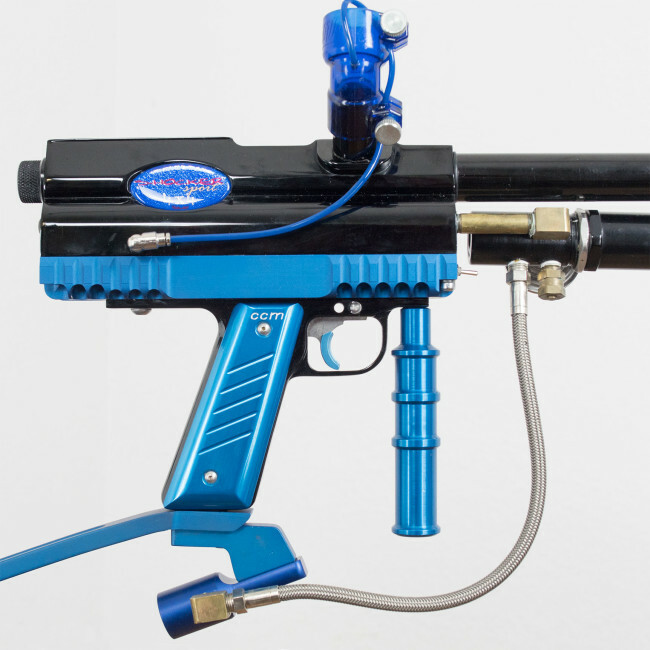 The Automag is pictured above. I thought the cuts might have been from Carter Machine but the vertical notches on the rail and stock are unlike the many Carterized Mags I’ve come across, any clues would be appreciated on this Automag. Right side view of Granata’s Shocker showing the Air Assist going into the elbow. Left side view of Anthony Granata’s Shocker with horizontal mounted Max Flow Reg. Towards the end of the 90s Garett started playing with the CCM team at away events and also started working for/with Jason Chipley. Chipley owned CNC machines and at that point they began producing early CCM items. Front view of the Shocker with blue accessories. CCM Factory player with custom CCM pump Sniper. Photo by Dawn Mills, used with permission of Bill and Dawn Mills at Warpig. Here is a quick look at the delrin trigger that came in CCM's 86 slide frames that were sold with J2s and Series 6 pump markers. Andre and I played some UWL pump practice games on saturday January 7th at SC Village with The Foot Clan. 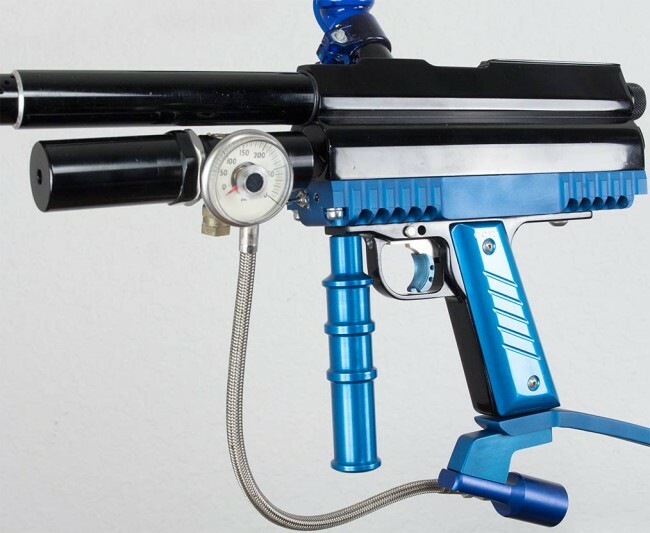 David Ahdoot talks about CCM's Series 5 Regulator and explains the year and models it came with. This came on both the pump and semi models. 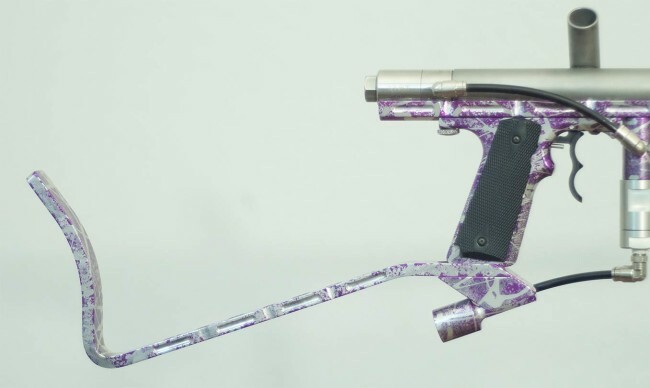 Here is a neat matte grey Kapp right feed Autococker with a CCM swing frame and a Jam Bolt. I didn't like the two matte greys together. A look at a nicely built Inception Designs Ripper Mechanical Autococker that Justin Dover has assembled. He explains the components used and then cycles it.